This week marks the 50th anniversary of the Dust Bowl troubadour's death. This week marks the 50th anniversary of the death of American music pioneer Woody Guthrie (1912-1967), the great original storyteller of folk music. Guthrie in many ways provided the soundtrack to the Dust Bowl era of the 1930s, when sustained droughts and withered crops in the Midwest sent thousands of working-class migrants scrambling West toward the supposedly greener pastures of California. A native of Oklahoma, Guthrie was no stranger to the drought, the dust, and their crippling effects on every aspect of life. Guthrie (pictured left) wrote many songs about the great migration of the 1930s, some of which were collected on his 1940 record Dust Bowl Ballads. One of the songs, “Do Re Mi,” took the form of a cautionary tale, warning listeners that there were already too many migrants seeking too few jobs in California, and that if they didn’t have enough money to get themselves there, they’d never make it. The message was echoed in John Steinbeck’s 1939 novel The Grapes of Wrath, wherein the Joad family pushes on to the West Coast in spite of death and disease, only to find a lack of opportunity in the promised land. Guthrie’s Dust Bowl songs inspired countless socially conscious musicians to take up the cause of the working class, from Pete Seeger to Bruce Springsteen, Nanci Griffith, Bob Dylan, Joe Strummer and Jeff Tweedy. Another acolyte, Ani DiFranco, included a live version of “Do Re Mi” on her 2000 EP Swing Set. DiFranco’s new album, Binary, came out in June, and Paste was thrilled to host her in our New York Studio for a live session. 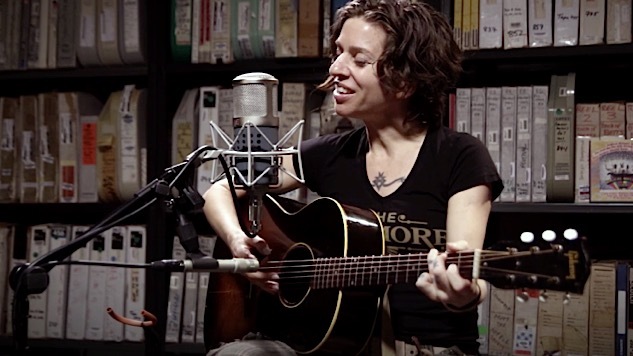 As part of her performance, DiFranco performed a cover of “Do Re Mi.” Watch the song below, and check out her entire Paste session right here. DiFranco is currently on tour behind Binary. You can find the dates here.